Enhaces the wood grain and gives a warm and natural shade, more or less honey-coloured depending on the wood species. Fungicidal formula, prevents greying due to weather influence and protects against mildew. -Apply with a brush on clean and dry wood (wipe the surplus with a Cotton Cloth). Beforehand, eliminate greying with the Bleach Stain Remover (rinse and let dry) or by sanding the wood. -Can be removed with Wax & Dirt Remover louis XIII below. 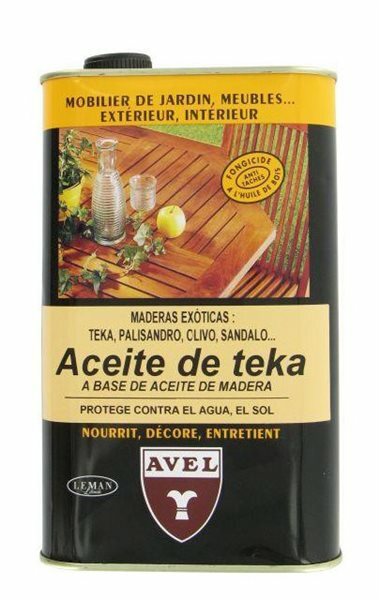 -We recommend to leave the teak wood in its natural state for easier penetration of the oil. -Average use approx. 18m2/litre n= 45m2 for a 2.5 liter can. -You can treat approx. 15 chairs with 1 liter of product.